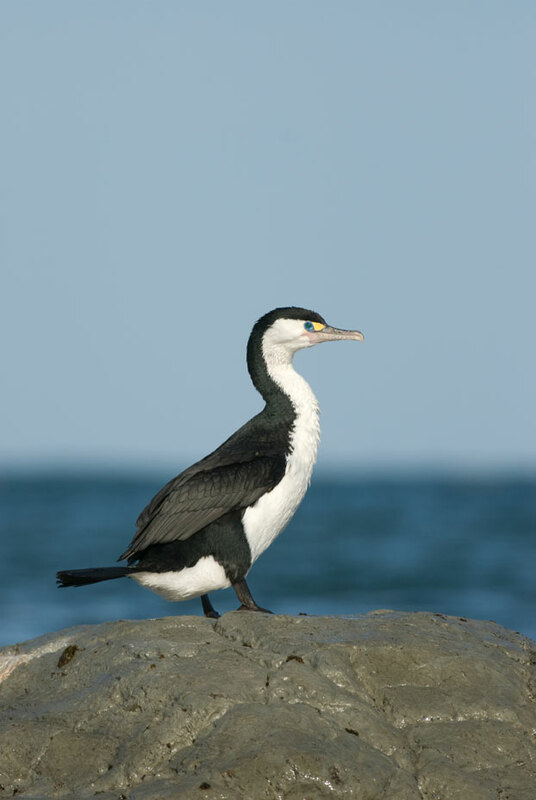 The Pied Shag, also known as Karuhiruhi, holds the 2008 National Threat Category of Nationally Vulnerable. They are often found at Te Arai Stream, which they use to wash and fish, also found roosting at Slipper and surrounding lakes. Shags, or Cormorants, when not sunning themselves dry with outstretched wings, can be found feeding, normally alone or in a small group of up to twenty birds. They are generally silent away from their colonies but at the nest are noisy, making a variety of harsh croaks and ‘wheezy whistles’. Most Pied Shags nest in small colonies of between 5-30 pairs and not over 50. Pied shags are incredible divers with the largest dive recorded over 225 seconds in 20m deep water(Heather and Robertson 2005). The main breeding areas in New Zealand are around Kaipara and Hokianga Harbours, on the east coast of the North Island from Doubtless Bay to Gisbourne, in the South Island from Tasman Bay through the Malborough Sounds and south to Banks Peninsula, in Fiordland and on the east coast of Stewart Island. Colonies are on fresh water lakes at Pupuke, Auckland, Elterwater in Malborough and Rotorua in Kaikoura. Generally sedentary Pied Shag rarely venture inland, with the exception of some juveniles. Pied Shags nest in colonies, sometimes with other shags including the Black and Little Shag. Most colonies are active all year round but laying peaks from July to October. They lay 2-5 eggs. incubation lasts between 25-33 days and the chicks hatch over the space of a few days. Diet is mainly fish such as flounder, mullet, perch, smelt and eels.